THE ancient civilizations vested the supreme power of musical inspiration in their goddesses; the Christian Era saw Saint Cecilia the patron saint of music; medieval times found the troubadours seeking inspiration in the noble ladies of their time; but it was not until the Italian Renaissance that woman became an interpreter of music. The harpsichord, one of the precursors of the pianoforte, was the domestic instrument of that time and we read of many young ladies as clever players, Scarlatti’s daughter bearing off the palm. Contemporaneously in England the virginal was in vogue, so called because it was intended for the use of girls, or as some say, in honor of the virgin Queen Elizabeth, who is said to have been a skillful performer. At any rate, the instruments from the fifteenth to the eighteenth century, the harpsichords, virginals and clavichords, all precessors (sic?) of the pianoforte, were played almost entirely by women and the music specially written for women. They called for essentially feminine qualities, flexibility and grace; lent themselves to numerous coquetries, to gay and sprightly melodies, to the regular beat of the courante, minuet and sarabande. We hear the first word in regard to the American pianiste from the lips of a Frenchman, Pierre Brissot, who visited this country after the revolution and having heard some Boston girls play exclaimed, “God grant that the women of Boston may never like those of Paris, acquire ‘la maladie de perfection’ in the art of music, that destroyer of domestic virtues.” That aggressive little city that first sounded the tocsin of war and was the home of the first women’s club formed to eschew the drinking of the beloved beverage, the overtaxed tea, saw, too, the first efforts of the American girl to express her musical ambitions. Already some French teachers of music and dancing had come, driven from home by their own revolution. THE ADVANCE OF THE PIANO. At the end of the eighteenth century Europe saw important musical changes—saw the piano made by a French manufacturer, that revolutionized the art of playing; saw it not only a vehicle for the display of flexibility but also one for the exhibition of brawn and muscle. Man thought that now he might devote some time profitably to it, so it was not long before that new element, the virtuoso, sprang into the arena; Thalberg and Liszt dazzled with their heroics on the new grand pianos. About a quarter of a century later, 1823, the inventive genius of a Boston piano maker had outdistanced all old world effort. Originally he planned the piano principally with regard to feminine use; some were fitted with mirrors, some with desks, others with sewing tables and drawers for materials wherewith when my lady placed her dainty fingers on the keys, such a pandemonium of buttons, spools, scissors, that earned for the graceful spinet the name of “the rattle box.” “The Battle of Prague” was then the popular after dinner piece and though we think it needed no additions to realism after that, still it had its little attachment to give the report of the cannon at the thrilling moment. Railroad gallops were also favorite selections, accompanied by the puffing of little steam cars, running up and down on little tracks on top of the piano. So much for catering to feminine taste. The Boston piano maker was now, in 1840, making his pianos with iron frames, and the German pianists he brought over were giving concerts surrounded by open-eyed girls eager to learn, who played nothing but “The Maiden’s Prayer” and “The Battle of Prague.” The pianists cut up all kinds of antics, made all kinds of noise and played thunder and lightning and battle pieces. During their few weeks’ stay in each city the ambitious girls engaged them for lessons. They, of course took their money, but their seriousness as a huge joke. It was the fashion that every well-bred girl should play, for did not this ladylike accomplishment show off her slender waist, her coquettish curls and tapering fingers? It was the weapon to attack the masculine heart; what passion cannot music raise and quell? She learned to play a few pretty tunes for company, just as she learned to paint a few pictures for the parlor, half of which was usually done by the teacher. Her notes always before her, people might think she was not able to read the cabalistic signs, as very frequently she was not. She must, however, fulfill the requirements of the ideal girl of the period—the wasp-waisted creature, who scorned the vulgarity of an appetite, full of tears, dyspepsia and graceful fainting spells. Then the war came, the foreign pianists went home, the seminaries were closed. The southern girl, surrounded by slaves, without the ambition of her New England sisters, satisfied as long as she had pretty clothes and plenty of beaux, now faced the cruel realities made by the war. When peace was restored the deathknell of sickly sentimentality had been sounded. It was succeeded by a more serious effort in all departments of women’s education. William Mason had returned from Germany, a thorough musician and pianist, prepared to give young Americans their first real opportunity to study music and to train them in the classics of Bach, Beethoven and Mozart. Conservatories were founded with great rapidity in all the large cities, the standard of piano playing speedily advanced and what would have been impossible fifty years ago is to-day a commonplace. Numbers of women pianists of skill, both amateur and professional, now reside in all our large cities. Within the past twenty-five years, two American pianists, Fannie Bloomfield-Ziesler and Theresa Carreño, have achieved world-wide fame, and a score or more of younger artists have won distinction. It is not, however, with preeminence with which we are concerned. Every one counts among one’s friends girls who have the taste and ability to play the classics acceptably. Such is not generally the case in Europe (Great Britain excepted), where the traditions concerning women discourage any great mental or artistic effort, where “that brilliantly detestable instrument,” as Bernard Shaw calls it, is more of a luxury. In America it follows in the trail of the woodman’s axe; there is no more strenuous man than the piano agent, consequently it is found in the house of the mechanic as well as in that of the millionaire. Under these more favorable conditions the ranks of the American pianiste are constantly gaining in importance. It is, however, no longer the custom for every girl to learn to play, irrespective of talent. There are too many fields of activity now open in the business, professional, and artistic world, too many opportunities for every sort of education and taste for the modern girl to fritter her time away on things for which she has no aptitude. If she have the gift it is developed seriously as a means of culture or in these days of rapidly changing fortunes, as a means of support. Playing at art is out of date, a worn out tradition, now happily abandoned, to the manifest advantage of music. 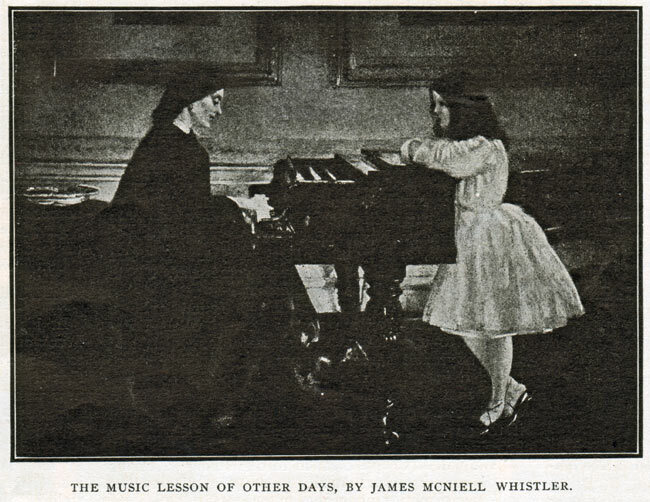 You are reading The American Woman Pianist of To-day and Yesterday from the July, 1909 issue of The Etude Magazine. The Influence of Women on the Great Composers is the next entry in The Etude.